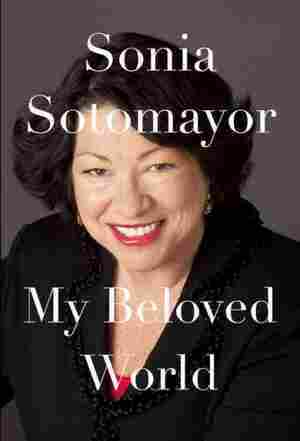 My Beloved World NPR coverage of My Beloved World: A Memoir by Sonia Sotomayor. News, author interviews, critics' picks and more. The first Hispanic-American on the U.S. Supreme Court shares the story of her life before becoming a judge, describing such experiences as her youth in a Bronx housing project, her relationship with a passionately spiritual grandparent, the ambition that fueled her Ivy League education and the individuals who helped shape her career. January 13, 2014  The Supreme Court justice tells Fresh Air's Terry Gross, "In every position that I've been in, there have been naysayers who don't believe I'm qualified or who don't believe I can do the work." She has committed herself to proving those people wrong. Successful Children Who Lost A Parent — Why Are There So Many Of Them? October 16, 2013  Writer Malcolm Gladwell calls them "eminent orphans" — an intriguingly large number of successful politicians, statesmen, poets, scientists who lost a parent when they were young. Why the pattern? Is it just coincidence? Or is it something more? 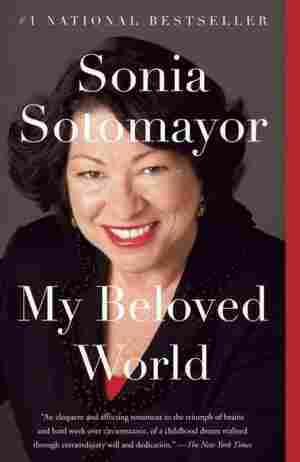 January 14, 2013  Intelligent, gregarious and at times disarmingly personal, Justice Sonia Sotomayor's memoir, My Beloved World, recounts her trailblazing journey from a Bronx housing project to a bench on the Supreme Court. 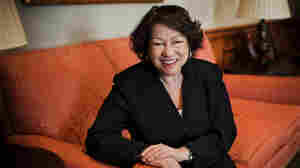 January 12, 2013  In Sonia Sotomayor's new memoir, My Beloved World, the associate Supreme Court justice opens up about her childhood in the Bronx. NPR's Nina Totenberg calls it a moving and unexpectedly personal look at the court's first Hispanic justice. January 12, 2013  Supreme Court Justice Sonia Sotomayor is open about how she benefited from affirmative action, how she came to terms with her diabetes and the "out-of-body experience" of being appointed to the high court. 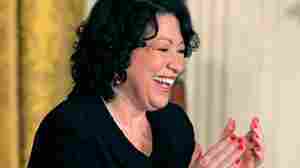 Sotomayor spoke with NPR just before the release of her new autobiography. I was not yet eight years old when I was diagnosed with diabetes. To my family, the disease was a deadly curse. To me, it was more a threat to the already fragile world of my childhood, a state of constant tension punctuated by explosive discord, all of it caused by my father's alcoholism and my mother's response to it, whether family fight or emotional flight. But the disease also inspired in me a kind of precocious self- reliance that is not uncommon in children who feel the adults around them to be unreliable. There are uses to adversity, and they don't reveal themselves until tested. Whether it's serious illness, financial hardship, or the simple constraint of parents who speak limited English, difficulty can tap unsuspected strengths. It doesn't always, of course: I've seen life beat people down until they can't get up. But I have never had to face anything that could overwhelm the native optimism and stubborn perseverance I was blessed with. At the same time, I would never claim to be self-made — quite the contrary: at every stage of my life, I have always felt that the support I've drawn from those closest to me has made the decisive difference between success and failure. And this was true from the beginning. Whatever their limitations and frailties, those who raised me loved me and did the best they knew how. Of that I am sure. The world that I was born into was a tiny microcosm of Hispanic New York City. A tight few blocks in the South Bronx bounded the lives of my extended family: my grandmother, matriarch of the tribe, and her second husband, Gallego, her daughters and sons. My playmates were my cousins. We spoke Spanish at home, and many in my family spoke virtually no English. My parents had both come to New York from Puerto Rico in 1944, my mother in the Women's Army Corps, my father with his family in search of work as part of a huge migration from the island, driven by economic hardship. My brother, now Juan Luis Sotomayor Jr., M.D., but to me forever Junior, was born three years after I was. I found him a nuisance as only a little brother can be, following me everywhere, mimicking my every gesture, eavesdropping on every conversation. In retrospect, he was actually a quiet child who made few demands on anyone's attention. My mother always said that compared with me, caring for Junior was like taking a vacation. Once, when he was still tiny and I wasn't much bigger, my exasperation with him inspired me to lead him into the hallway outside the apartment and shut the door. I don't know how much later it was that my mother found him, sitting right where I'd left him, sucking his thumb. But I do know I got walloped that day. But that was just domestic politics. On the playground, or once he started school at Blessed Sacrament with me, I watched out for him, and any bully thinking of messing with him would have to mix it up with me first. If I got beat up on Junior's account, I would settle things with him later, but no one was going to lay a hand on him except me. Around the time that Junior was born, we moved to a newly constructed public housing project in Soundview, just a ten- minute drive from our old neighborhood. The Bronxdale Houses sprawled over three large city blocks: twenty- eight buildings, each seven stories tall with eight apartments to a floor. My mother saw the projects as a safer, cleaner, brighter alternative to the decaying tenement where we had lived. My grandmother Abuelita, however, saw this move as a venture into far and alien territory, el jurutungo viejo for all practical purposes. My mother should never have made us move, she said, because in the old neighborhood there was life on the streets and family nearby; in the projects we were isolated. I knew well enough that we were isolated, but that condition had more to do with my father's drinking and the shame attached to it. It constrained our lives as far back as my memory reaches. We almost never had visitors. My cousins never spent the night at our home as I did at theirs. Even Ana, my mother's best friend, never came over, though she lived in the projects too, in the building kitty- corner from ours, and took care of my brother, Junior, and me after school. We always went to her place, never the other way around. The only exception to this rule was Alfred. Alfred was my first cousin — the son of my mother's sister, Titi Aurora. And just as Titi Aurora was much older than Mami, and more of a mother to her than a sister, Alfred, being sixteen years older than I, acted more as an uncle to me than a cousin. Sometimes my father would ask Alfred to bring him a bottle from the liquor store. We counted on Alfred a lot, in part because my father avoided driving. This annoyed me, as it clearly contributed to our isolation — and what's the point of having a car if you never drive it? I didn't understand until I was older that his drinking was probably the reason. My father would cook dinner when he got home from work; he was an excellent cook and could re- create from memory any new dish he encountered as well as the Puerto Rican standards he no doubt picked up in Abuelita's kitchen. I loved every dish he made without exception, even his liver and onions, which Junior hated and shoveled over to me when Papi's back was turned. But as soon as dinner was over, the dishes still piled in the sink, he would shut himself in the bedroom. We wouldn't see him again until he came out to tell us to get ready for bed. It was just Junior and I every night, doing homework and not much else. Junior wasn't much of a conversationalist yet. Eventually, we got a television, which helped to fill the silence. My mother's way of coping was to avoid being at home with my father. She worked the night shift as a practical nurse at Prospect Hospital and often on weekends too. When she wasn't working, she would drop us off at Abuelita's or sometimes at her sister Aurora's apartment and then disappear for hours with another of my aunts. Even though my mother and I shared the same bed every night (Junior slept in the other room with Papi), she might as well have been a log, lying there with her back to me. My father's neglect made me sad, but I intuitively understood that he could not help himself; my mother's neglect made me angry at her. She was beautiful, always elegantly dressed, seemingly strong and decisive. She was the one who moved us to the projects. Unlike my aunts, she chose to work. She was the one who insisted we go to Catholic school. Unfairly perhaps, because I knew nothing then of my mother's own story, I expected more from her. However much was said at home, and loudly, much also went unsaid, and in that atmosphere I was a watchful child constantly scanning the adults for cues and listening in on their conversations. My sense of security depended on what information I could glean, any clue dropped inadvertently when they didn't realize a child was paying attention. My aunts and my mother would gather in Abuelita's kitchen, drinking coffee and gossiping. "¡No me molestes! Go play in the other room now," an aunt would say, shooing me away, but I overheard much regardless: how my father had broken the lock on Titi Gloria's liquor cabinet, ruining her favorite piece of furniture; how whenever Junior and I slept over with our cousins, my father would phone every fifteen minutes all night long, asking, "Did you feed them? Did you give them a bath?" I knew well enough that my aunts and my grandmother were all prone to exaggeration. It wasn't really every fifteen minutes, but Papi did call a lot, as I gathered from my aunts' exasperated and mechanically reassuring side of the conversations. The gossip would then take a familiar turn, my grandmother saying something like "Maybe if Celina ever came home, he wouldn't be drinking every night. If those kids had a mother who ever cooked a meal, Juli wouldn't be worrying about them all night." As much as I adored Abuelita — and no one resented my mother's absence more than I did — I couldn't bear this constant blaming. Abuelita was unconditionally loyal to blood kin. Her sons' wives were not outside the ambit of her protection, but they didn't enjoy the same immunity from prosecution. And often my mother's efforts to please Abuelita — whether a generously chosen gift or her ready services as a nurse — went dimly acknowledged. Even being Abuelita's favorite, I felt exposed and unmoored when she criticized my mother, whom I struggled to understand and forgive myself. In fact, she and I wouldn't achieve a final reconciliation before working on it for many years. My surveillance activities became family legend the Christmas that Little Miss Echo arrived. I had seen the doll with its concealed tape recorder advertised on television and begged for it. It was the hottest gift of the season, and Titi Aurora had searched far and wide for a store that still had one in stock. I sent my cousin Miriam into the kitchen with the doll to bug the adults' conversation, knowing that I would have been immediately suspect. But before anything could be recorded, Miriam cracked and gave me up at the first question, and I got walloped anyway. One overheard conversation had a lasting effect, though I now remember it only dimly. My father was sick: he had passed out, and Mami took him to the hospital. Tío Vitín and Tío Benny came to get Junior and me, and they were talking in the elevator about how our home was a pigsty, with dishes in the sink and no toilet paper. They spoke as if we weren't there. When I realized what they were saying, my stomach lurched with shame. After that I washed the dishes every night, even the pots and pans, as soon as we finished dinner. I also dusted the living room once a week. Even though no one ever came over, the house was always clean. And when I went shopping with Papi on Fridays, I made sure we bought toilet paper. And milk. More than enough milk. 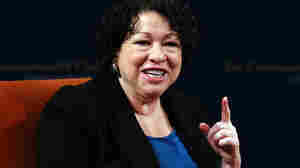 Excerpted from My Beloved World by Sonia Sotomayor Copyright 2013 by Sonia Sotomayor. Excerpted by permission of Vintage, a division of Random House LLC. All rights reserved. No part of this excerpt may be reproduced or reprinted without permission in writing from the publisher.